It is great to see this venerable race, which used to feature teams from California & that Shannon Rowbury once raced, coming back. The race offers teams the chance to get a feel for the course, where the State meet is held, and quite a few teams took advantage of the opportunity, although one would think that even more would avail themselves. The girls’ varsity race gave a tantalizing preview of some of the possibilities of the 6A State race, but South Eugene was a notable absentee. Grant freshman Ella Donaghu continued her impressive first campaign by edging Paige Rice of St. Mary’s Academy. They crossed the finish less than a second apart with Ella dipping under the magic eighteen minute barrier with 17:59 and Paige running eighteen flat. It was a great two-person duel, yet there was a strong cast of runners relatively close behind including Maggie Schmaedick of Sheldon, who placed third with 18:11. Grant claimed the next two places as Parkes Kendrick (18:35) & Piper Donaghu (18:49) followed and then SMA runner Ellen Patterson finished sixth in 18:53. Gracie Todd of Sheldon placed seventh in 18:56 and then Piper McDonald of Summit checked in with 18:58. Jesuit’s Ellie Kallgren led the Crusaders with her ninth place effort in 19:01 and Lacey Conner of St. Mary’s secured tenth with 19:02. Sierra Brown of Hidden Valley took eleventh in 19:03 and was followed across the line by Dylan Hite of Jesuit & Tess Michaelson of Lincoln. Defending 3A champion Olivia Powell of Creswell had an off-day coming in 19th (19:48). The Grant girls won the team battle with a low of 64 points to Jesuit’s 76. St. Mary’s was a distant third with 102. The Summit guys showed their strength up front by taking the top two places in spite of the fact that their defending State 5A champion Travis Neuman did not race. Super sophomore Matthew Maton had another big race, as he won with a swift 15:29 and Eric Aldritt was not far behind with his strong effort of 15:24. Jackson Darland of Sheldon proved that he will be a force at state with his third place effort in 15:45. Californian Josh Whelan finished fourth in 15:47 and Matthew Campbell of Siuslaw was fifth in 15:53. Just two seconds behind him was Nick Obletz of Oregon Episcopal. Mitchell Butler of Siuslaw garnered seventh with 16:00 and Tanner Smith of Lincoln followed with 16:08. Ninth went to Mack Marbas of Siuslaw showing the gang from Florence will be tough to top in 4A and then Hunter McGuirk of Jesuit earned tenth in 16:12. Ray Schireman of North Medford rounded out the top eleven with a time of 16:15. Jesuit topped Siuslaw for the team title 70 to 100, while North Medford took third with 139. The biggest race this weekend in the Northwest was at Eagle Lake outside of Boise, where strong teams from Washington & Utah invaded Idaho for the annual showdown. Katie Knight of North Central secured her second straight triumph here with her mark of 17:59. Summer Harper of Orem was the first of a number of Utah runners with Shea Martinez of Davis taking third with 18:13. Lucy Biles of Herriman (18:17) Sarah Feeny of Ogden (18:18 & Ellie Child of Davis & Emily Rich of Bingham (18:35) were all part of a Utah parade, which dominated the race up front – save Knight, who is in a special class. Hailey Ricks of Star Valley in Wyoming (18:18:40) & Charlotte Corless of Sunset (Oregon – 18:47) & Alisse Walker of Park City (18:50) continued the invading procession before Caroline Weiler of Skyline crossed the finish in 11th as the first in-state runner with 18:58. Boise’s Emily Hamlin ran 19:00 to place 13th & Mikayla Malaspina of Vallivue was 14th in 19:02. Jessica Sams of Ogden came in 15th with 19:03 & Presli Hutchinson of Highland was 16th with 19:03 as well. Olivia Redd of Sugar Salem won division I with 19:00 & Katriel O’ Reilly of Union placed fourth with 20:15. Davis won the team title. The boys’ race became a duel between Washington juniors Joe Hardy of Seattle Prep & Kai Wilmot of North Central, as Hardy claimed victory by two seconds with a time of 15:03. Ben Saarel of Utah earned third with 15:08 & Jake Heslington of Timpanogos (Utah) came in fourth with 15:26. Tanner Anderson of N C ran 15:32 & Elijah Armstrong of Pocatello finished sixth in 15:35 – the first loss of the year for the sophomore runner. Estevan De La Rosa of Arcadia ran 15:46 – good for seventh and his team mate Pratt Mitchell followed in 15:47. Jordan Cross of Ogden was 8th with 15:50 and Keith Williams of North Central was credited with the same time with his tenth place time & Andrew Brewer of Bingham secured 11th in 15:53. Ricky Faurer of Rock Springs in Wyoming placed 12th in 15:57 and Chuck Mitchell of Herriman was the last runner under sixteen minutes, as he placed 13th in 15:58. North Central managed to place six of its runners in the top twenty to easily top Arcadia 47 to 127 – just hoping the people handling the rankings take note for a change. Amy-Eloise Neale & her sidekick Katie Bianchini continued their merry romp through the season’s competition by posting times of 17:04 and 17:44 at Bellevue. Andrea Masterson of Lakeside placed third with 18:14 and Darryl Phill of Bellarmine prep earned fourth with 18:43. Devon Grove of lake Washington had a fine 15:39, as he defeated Spike Sievert of Bellevue, who ran 15:42. Drew Schreiber of Eisenhower placed third in 15:56 and Gareth Jones of O’Dea ran 16:02 for fourth. Cody Williamson of Shelton edged Daniel Mayer of Mercer Island with both being credited with 16:07. Patrick Gibson of Squalicum won his second straight title here with a time of 15:09. His closest pursuer was British Columbia runner Nathan Wadhwani, who ran 15:15. Brittany Gappa, also from Squalicum, topped the girls with 18:19. Mimi Meggison of Meridian placed second with 18:52. Paul Ryan of Logos ran away from the field with 16:11 with Micah Dingfield placing second in 17:00. Josie Lonai of McLoughlin led the girls with 20:34. This race, held in Portland, saw Nick Obletz of OES run away with the victory with a time of 16:39. Southwest Christian swept the next three places to take control of the team race. Trevor lane (17:40), Nick Martin (7:58) & David Bogert (18:37) led the way before Luca Osterag-Hill of Catlin Gable broke the string with his fifth place effort of 18:55. Samantha Lindauer of Vernona ran 21:45 to win the girls’ race. Nina Weaver of SWC placed second just four seconds later and Hannah Jaquiss of Catlin Gable placed third with 2:04. Jenna Hills of SWC followed in fourth with 22:37. This mid-week race in Idaho saw Andrew Follett of Idaho Falls win in 16:26, while Kyle Baldwin of Bonneville placed second in 16:34. Dillon Kunz of Rigby was third with 16:48. Jasmine Nesbitt of Jerome topped the girls with 19:10. .
Jackson Packham of Franklin dueled Abdi Amin of Cleveland with the Quaker runner getting the triumph in 16:32. Amin followed with 16:36 and Christopher Black of Franklin was third with 16:44. Roba Sultessa (16:47) and Noah Leonard (16:57) took 4th & 5th respectively. Emma Wren of Cleveland was the only girl under twenty minutes and her clocking of 19:49 gave her any easy victory. Isabel Leonard of Franklin placed second with 20:30 & Margaret Lauer, also from Franklin, ran 20:45. Ellie Forest of Cleveland & Chloe Retallack of Franklin came in 4th & 5th. Brooke Chuhlantseff of West Albany scored her second victory of the season with a time of 19:52. Aloha’s Desyre Blackburn ran 20:14 to edge Anne Christensen of West Albany, who was credited with the same time. Kathleen Nesbett & Amanda Stowe of Aloha garnered fourth & fifth. Spencer Bybee won the boys’ race. The West Salem athlete was timed in 18:05. Isaac Barr of West ran 18:31 for second & was followed by Matthew Painter of Aloha (18:38). Allie Ostrander of Kenai will head to State as the overwhelming favorite once again after racing home in 18:10. Audrey Michaelson of Colony followed her in the 4A race with 19:05. Maria Burroughs of Wasilla led her team to victory with her third place effort of 19:09. Wasilla also claimed 4th & 5th as Peggy Mathis & Jenna Ford took the next two spots. Claire Trujillo topped the 3A field with 19:46 & was followed by Elle Arnold , Morgan Lash & Cheyenne Applegate followed to give Grace Christian a sweep of the division. Miles Knotek of Seward ran 17:11 to win 3A with Arlen Mossgrove placing second in 17:16. The Kodiak guys earned another trip to State behind the 1 – 2 finish of Levi Thomet (16:30) & Cole Christiansen (16:36). Brandon Schaffer of Colony was third with 17:02 and led his team to a second place finish. Brooke Lizotte of Lathrop won and was followed across the line by her team mates Megan Kubicek & Allison Hebard and the Malamutes head to State as the regional victors. Julia Sherman of West Valley placed fourth to lead her to a berth with second. The West Valley boys led by peter Noon, who ran 16:57, head to state after nailing their regional title. Lathrop’s Sam King was the first non-WV runner with a 4th place finish. Kuba Grzeda, the defending State champion, placed fourth with 17:22. John Farr of East Anchorage ran 16:58 but Service dominated the boys’ race once again to win with a low of 31 points. Service swept positions two through five with Gilly Szweda-Mittelstadt, Lucas Schlemme, Lucas Hepler & Taylor Turnley. West Anchorage won the girls’ team race but Rachel Roelle of West Anchorage won the individual title with 19:40. Grace Graham of East (19:57), Hannah Stevens of Eagle River (19:57) & Jenette Northey of Service (20:03) secured second through fourth with Lydia Blanchet of West taking fifth in 20:09. Maddie Hall of Thunder Mountain won the large team race with 20:02 as her team defeated Juneau-Douglas 32-33 and will head to State. Taylee Nyquest of Thorne Bay had the fastest time of the day among young ladies with her mark of 19:26. William Brand topped the 3A boys with 17:42. Tal Norvell of JD led the 4A boys with 16:55 and his team heads to State. Riley Moser of Thunder Mountain (17;20), Khalil English (17:52) & Chris Llanos of Ketchikan (18:03) took 2nd through 4th. With cool temperatures and a fairly stiff breeze there was no need for the burgeoning fall colors to betray the first day of Autumn at the course just north of Chicago. Volunteer workers arrived early – most with warm coffee in hand to set up the meet headquarters. Interestingly enough a number of the workers wore bright red shirts, which said Palatine XC Club, which I find almost inspirational. The volunteer & booster area was ready to go by the time that the first bus load of harriers (Lake Zurich gets that honor) disembarked from their bus at 6:50 AM. It’s also worth noting that the course was already lined and marked out from the day before & it has withstood the driving rain from the previous night. As the runners were still arriving, a flock of geese flew in formation above, as if part of the meet festivities. It did not take long to view a small pack of runners navigating the trail at the edge of the woods. The signs were all in place to herald, that we were well into another cross country season and, better yet, there would be plenty of talent on hand: both local and national in caliber. The meet has been growing in prominence and this year it features York High for the first time but of course it helps, when the host team is the defending State champion. On hand would be invading teams from Ohio, Missouri and Kentucky, which means the races should have an impact on the rankings. It was only a little after 7 AM, yet it was already a promising day. Still there would be a bit of drama, for the clouds, which had appeared to be dissipating and had allowed some blue to appear in the sky put in one last surge, like that of a fading runner to get back in the race, to cloud over once again and even let a few drops fall before giving way to a surprisingly clear day. The course is a nice XC course with some slight grades to force runners to change gears but with nothing that could actually be considered a true challenge. It was essentially a loop course, which offered fans a chance to view mid-race and end of the race action, plus of course the start. The field in each race was fairly large but the starting area was so wide and elongated that the field did not seem too large and everyone had room to get out well. It was not long before the freshman began the festivities and the carnival began. There sadly is not time to look at the full picture here but the varsity races were certainly worth watching. Kaylee Flanagan, a Foot Locker finalist last fall, assumed the lead early and began her inexorable surge to the finish. By mid-race she had forged a solid lead despite the wind. About 20-30 meters behind followed a chase pack, which actually went out rather hard, although thanks to young Miss Flanagan, it did not appear to be so hard. Among that group were Sami Staples of Crystal Lake, Kaitlyn Ko of Buffalo Grove, Lauren Conroy of Barrington & Emily Leonard of Maine South. Also joining the fray was Tess Wasowicz of Palatine, who noted that last week she had “gone out a little too fast” and wanted to stay back early. It is one of those lessons, that all runners must learn to be successful, but most of us find difficult to accomplish. The runners from nationally ranked Assumption appear to have mastered that art and their lead trio of Bailey Davis, Katherine Receveur & Emily Bean were lodged together no higher up than eighth, when they rounded the turn to head out onto the second loop. Racing ahead was Flanagan, who knifed her way through the gusting wind on her way to an almost improbable record on the course given the conditions. Her time was 16:49 and Kaylee ’s victory is the fourth invitational win of the season. Davis and Receveur picked off runners during the course of the final stage to garner second & third with times of 17:24 & 17:27. Sami Staples caught Tess Wasowicz coming down the home-stretch to finish a second earlier with 17:29 and it was another second back to Kaitlyn Ko in sixth. Lauren Conroy finished 7th with 17:41 for the three mile course and Emily Leonard claimed 8th in 17:42. Assumption’s Emily Bean crossed the finish line ninth (17:43), Talia Duzey of Cary Grove took 10th with 17:44 and Lauren Opatrny of McHenry was eleventh in 17:48. Hannah Winter of St. Viator was credited with the same time and Assumption’s Kenley Defler followed a second later in 12th with 17:49. Haley Verbeke of Moline ran a fine 17:50 to come in fifteenth. 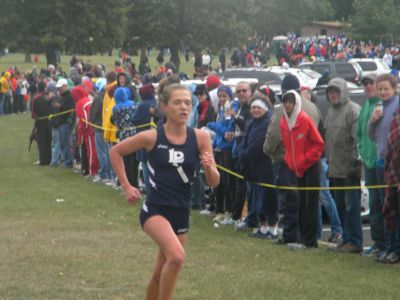 Although traditional scoring showed Assumption to be the easy winner by a 50 to 112 margin over Lake Park and 132 for Palatine, placement in the meet was depicted by overall time of the top five and Assumption easily claimed that honor, as its fifth runner, Kate Crawford, was timed in 18:07. They won by over a minute with Lake Park second. Incidentally, if you are already thinking of next year, Assumption’s top five are all juniors. The varsity boys raced featured Grant Nykaza & Jack Keelan, who were considered the premier runners in the state but it also had as an undercard the match-up between a resurgent York squad and nationally ranked St. Xavier, which like Assumption, is out of Louisville: a city with its own running Renaissance. Nykaza from Beecher went out hard and led the field through the mile in 4:47. He continued on point through the half-way mark and held a good solid 10 to 15 meter lead over a pack headed by Keelan of St. Ignatius. Included in the group of eight or nine runners were Xavier runners Conner Sheryak & Sam Lewis plus Billy Bund of Lake Forest, Chris Zambrano of Palatine & Luke o’ Connor of Jones, although I could not pick out the runner, who was in distinct third. Nykaza has high goals for the season and this race was a key part of his overall plan and he visibly gritted his teeth, as he rounded the turn and then took off into the distance. Jack Keelan, of course, had no intention of letting him go and the Ignatius runner responded with his own surge. In a little more than a hundred meters the race had become a two-man duel. Keelan upped the ante by putting in two distinct surges, which were in turn covered by Nykaza. With less than a hundred meters to go a third move by Keelan had given him the upper hand and a slight lead but Nykaza dug deep and found “another gear” to regain the lead and take the victory with a time of 14:36.4. Jack Keelan followed less than a second later with 14:37.0. Both times were excellent given the wind and not that far off of the course record of 14:33 set by Jack Driggs of York in 2010. Alex Baker placed third in 14:53 and began a procession of runners, who sped across the finish line with solid times including fourth place finisher Micah Beller of Niles North, who ran 14:55. Fifth went to Luke O’ Connor (14:55) and sixth to Connor Sheryak (14:56), who won the Rumble In the Jungle two weeks ago. Jamison Dale of Jones ran 14:57 to place 7th and Chris May of York followed two seconds later in 8th. Ninth went to Billy bund in 15:00, while Sam Lewis rounded out the top ten with 15:01. 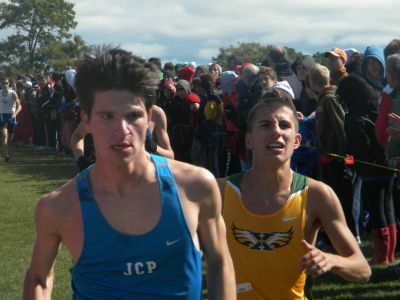 Alex Mimlitz of York (15:02) and Harry Winter of Fremd (15:03) completed the first dozen of quality runners. The team results found Xavier validating their ranking with a solid victory with 86 points over York with 96 and Jones with 97. Compliments to the race officials, who ran an efficient race, that provided quick awards and printed results. They even provided a noteworthy pre-race program, which listed favorites and their accomplishments, plus a handy map of the course. This race, run at an even three miles, was claimed by Kendall Cast (17:52) with Amanda Thate second with 18:02. Matt Stern led the guys with 15:50, who had a nine second gap over Ethan Brodeur of Naperville. This mid-week race pitted teams from the Louisville area on a scenic course with rolling terrain. Alyssa Shifflett of Bullitt broke away from Jessie Hartman of Nelson County and cruised to an easy victory in a time of 20:35. Harman raced alone the rest of the race coming in second in a time of 21:21. Colleen Orr closed well during the last mile, as she and her Louisville team mate Netania Lipp worked with her, before Orr separated herself down the stretch. Orr finished in 21:33 to take third by three seconds. Kayla Moore of Nelson County earned fifth with 21:59. 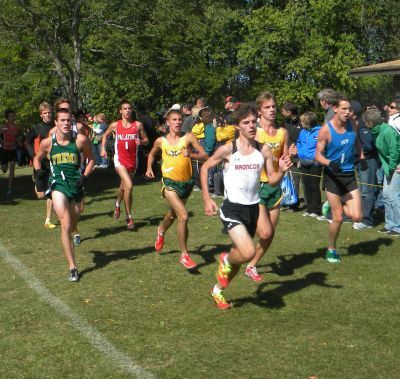 In the boys’ race Parker Head opened an early lead and was never threatened, as he secured victory in 17:22. 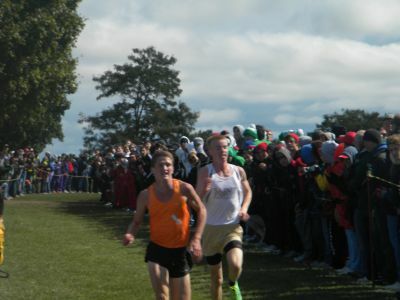 Matt Bode of Louisville C. placed second in 17:37 and Matt Graven of DeSalles finished third in 18:43. The race at the Kentucky Horse Park in Lexington went to Nicholas Laureano of Lexington Catholic in 16:29. Daniel Southard of Daviess County took second with 16:37, while Keegan Raidt of Trinity led his team to victory in 16:41. Whitney O’ Bryan of Daviess topped the field with 19:10 and her team mate Claire Payne followed in second with 19:15. Oldham County won the team victory with 67 points to Daviess’ 108. This race has a long and great history with a list of winners, who includes Bob Kennedy & Dathan Ritzenhein. The traditional course is a challenging one but it has been changed a number of times through the years, so it is difficult to compare with the glory days, when it was one of the largest races in the country. Mark Hadley of Youngstown Boardman had the fastest time of the day in the large-school race with 15:42. Ryan Gallagher of Buckeye won the D2 race in 15:51 defeating his team mate J J Grzincic by seven seconds. Cory Glines of Thomas Aquinas topped D1 with 16:33. Canton GlenOak runners Hannah Thompson & Jen Fockler finished two seconds apart with Thompson winning by two seconds with 19:47. Mckenzie Klim of Poland Seminary had the fastest female time with 18:44, when she claimed D2 and Allison parks of United led D3 with 18:59. Nick Ellswick of Chardon won his sixth race of the season with a victory in 15:44. Second went to Garrett Crichlow of Twinsburg in 15:55. Ally Markovich of Hawken scored in 18:28. Therese Haiss of Solon, who has won both at Tiffin and at Strongsville, placed second in 18:37, while Corinne Kule was third in 18:38. This meet in Indian Riffle Park in Kettering, Ohio was open to five states and Annie Heffernan of Cincinnati Ursula ran away with a time of 18:15. Maggie Allen of Sacred heart in Louisville finished second with 18:40. Patrick O’ Neil of Cathedral (Indianapolis) won the large-school division with 16:00 edging Jack Miller of St. Ignatius (Cleveland) by a second. The performance of the meet was turned in by Jacob Thomson of Holy Cross in Louisville, who ran 15:37, as the next fastest runner finished in 17:02. Just imagine, if he’d been in the other division? Foot Locker National finalist Julia Bos followed up her big victory from last weekend with a romp in 17:29. Molly Oren ran a fine time of 18:13 but was well behind and she in turn was almost twenty seconds ahead of the third place runner. Nick Vanderkooi ran 15:34 to nip Keenan Rebera by a second. Brando Winter won the other division with 15:49. Girls’ division winners were Kayla Kavulich (18:54) & Lauren Benstead (18:05), while Roger Phillips topped the guys with 16:13 to edge John Penington by two seconds. Costa Willets ran 15:44 to best Grant Fisher’s 15:50 and Taleen Shahrigian led the gals with 18:25. Yet another race with national significance with Ashley Erba reversing last week’s decision with Anna Rohrer. This week Erba won with a strong 17:13 and Rohrer was second with 17:32. Third went to Bobbie Burgess in 17:43, while Mackenzie Caldwell came in with 17:52. Sam Wharton whisked home in 15:14 with Jacob Poyner running 15:28. The same time was credited to Zach Panning, who placed third. Anna Aldrich was the fleetest gal with 18:24 and Ryan Smith nipped Jonathan Harper, as both were credited with 15:50. Tatnal girls went 1 -2 -3 with Reagan Anderson getting the victory with 18:58. Alex Giacco topped the boys with 16:22. Saratoga’s Taylor Driscoll won by 17 seconds with a time of 17:37. Alec Peinkofer of Baldwinsville triumphed with 15:34. Erin McConnell of Fabius-Pompey won her third straight invite with 17:37, which was far and away the finest girls’ time. Zakaria Adam of Proctor scored with a time of 17:25 on the 3.24 mile course. And, lest we forget, Fayetteville-Manlius did not run, as they are saving themselves for Manhattan and the Mud Bowl. Makena Morley, another Foot Locker finalist from 2011, scored again with a time of 17:31. The next finisher came in with 19:12. Kyle Olson led the way with 15:38 to win by almost a minute. Zach Perrin of Flathead raced home in 14:52 with Adam Peterman of Hellgate not that far behind with 14:59. Paige Gilchrist ran 18:01 for Hellgate to lead the girls. Chandler Diffee of La Follete won again over 5K with 15:35Spencer Hrycay placed 2nd with 15:42. It came down to the wire with the leaders recording times of 15:50 but Malcom Plunkett of South Burlington got the nod over Patrick Coppinger of Lowell. Taylor Spillane of Champlain Valley was the fastest of the girls with 18:07, as her team mate Autumn Eastman placed second in 18:23. Mackenzie Barry topped the juniors with 18:44, which was the fastest time for gals. Rob Napolitano ‘s time of 16:41 won the senior division & topped all the guys. Amanda Gehrich set a freshman record and had the fastest time of the day with her mark of 16:58. The time was a 50 second improvement over her clocking at Laguna Hills. Other divisional winners were Grace Schafer (Sophomore - 17:32), Amanda Stark (Juniors – 17:46) and Paige Canterbury (Seniors – 17:34). Garrett Corcoran, a junior from Villa Park, won his third invite with a time of 14:38, which was the fastest time of the day. Maria Hauger of Shakopee raced to a 4K victory in 13:58. The senior is yet to lose a race in state but her rival Danielle Anderson gave her a battle before fading to second late with 14:14. Anderson’s Eagon team, however, led that scoring with 75 points. Shane Streich was the best of the guys with 16:04. Brendan Sage finished 2nd in 16:13 – two seconds ahead of Cal Lawton of Eden Prairie, whose team won the team contest with 61 points. The meet, which was run in classes, saw Wayde Hall of Stillwater claim victory in 15:25. Steven Cotter of Andover finished 2nd in 15:45 followed by Eric Colvin with 15:49. Still runners took three of the top twelve places to win the meet with 27 points. Jenna Truedson of Bemidji ran 14:07 (4K) to top Anna French by ten seconds. French & her Wayzata teams topped the girls’ team results with 75 points. Josh Brickell, another Foot Locker runner, won here with a 5K time of 25:43. Arman Rehmann of Norcross was second with 15:49. Katherine Yost of Norcross led the girls with 18:29.